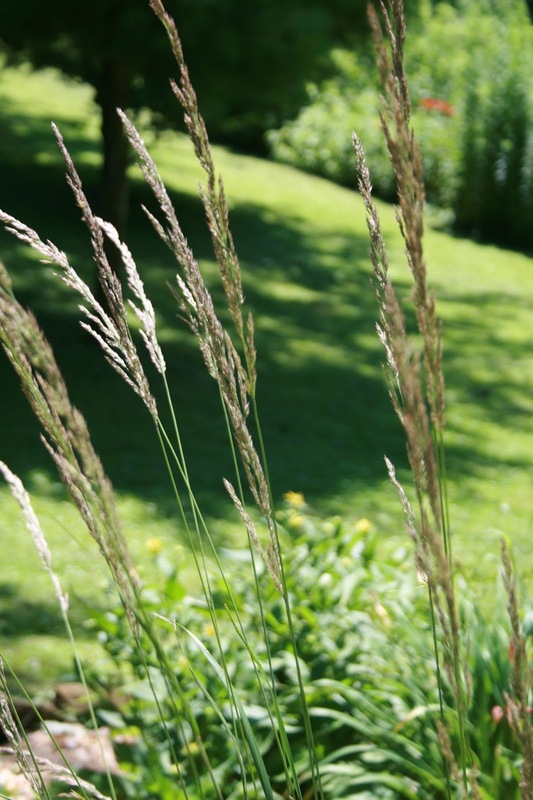 The middle of July is a gardener's paradise, for that is when most gardens are at full peak. It seems everything is full, lush, and colorful this time of the year. Most of the perennials have almost all bloomed by now, and the annuals are finally getting all the warmth and sun their hearts desired and have really filled out. Last week I showed you a single bloom of my Purple Coneflower as they were just starting to open up. This week, they are really peaking. What I love the most about this plant is that the blooms last a very, very, long time. Often well into late summer/early fall. Yes, the color fades a bit and change, but they still provide interest in the garden for quite awhile. Right now the color is very bright and attracting a lot of attention from the butterflies and bees. I got really lucky and even had a pretty butterfly sit for me for awhile so I could take his picture! 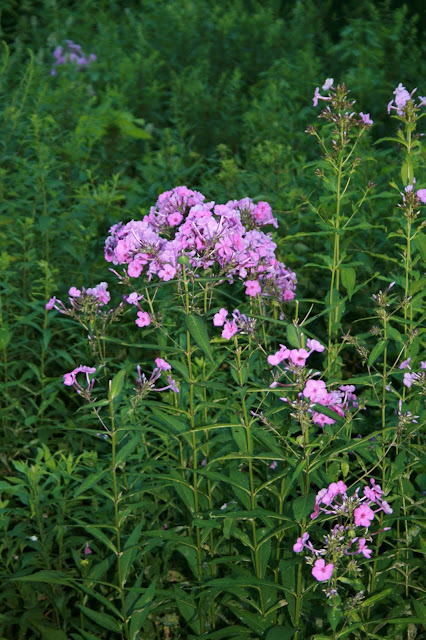 What phlox the deer did not eat is blooming beautifully too, like this purple one. 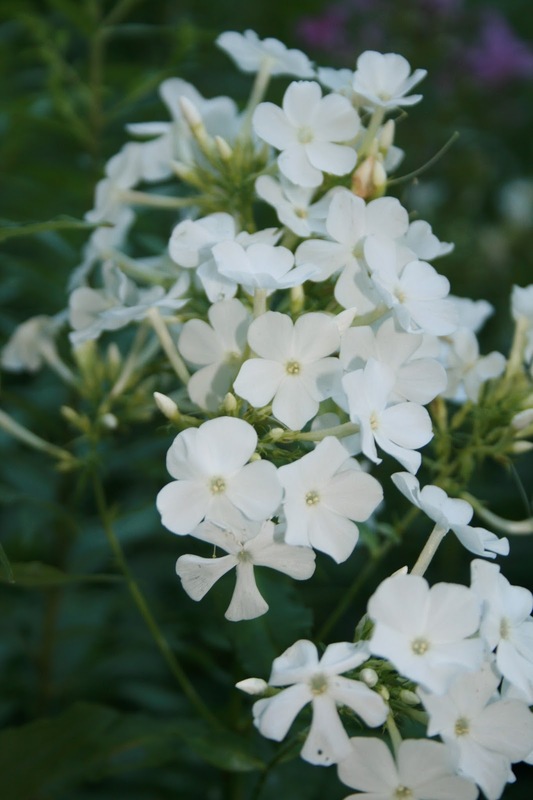 Here is a pretty white phlox. 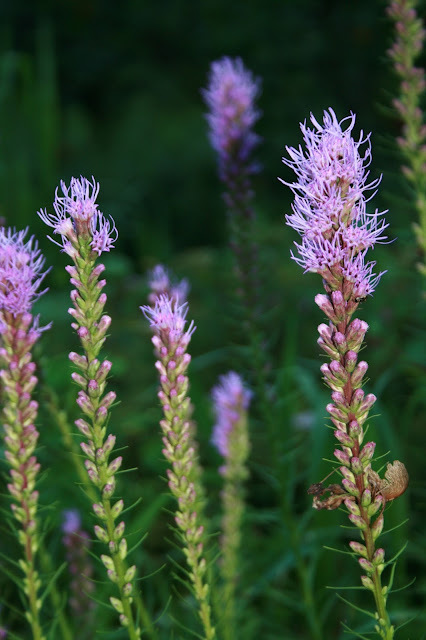 Liatris is one of my favorite wildflowers for it's not only very interesting, but very hardy and you can quickly divide the bulbs and make new plantings. I don't have as much Hollyhock this year as I normally do, but I did plant seeds for next year. 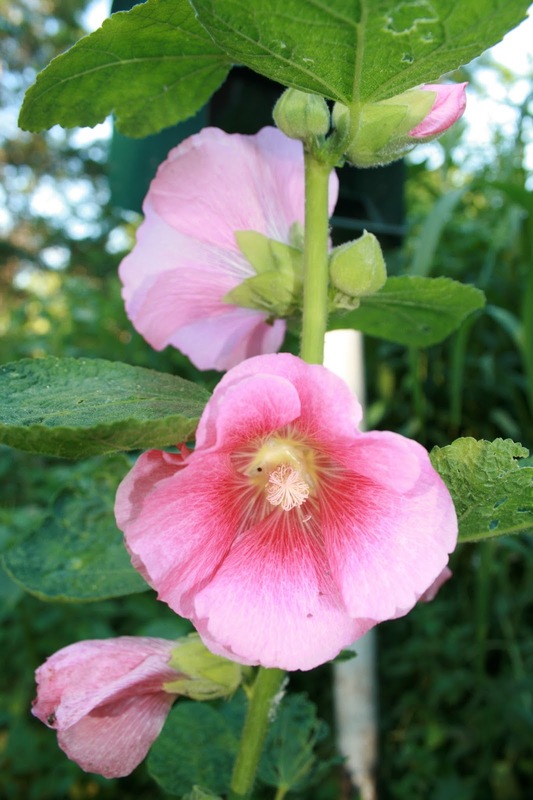 Hollyhock is a biennial so you have to plant seeds every year if you want blooms every year. 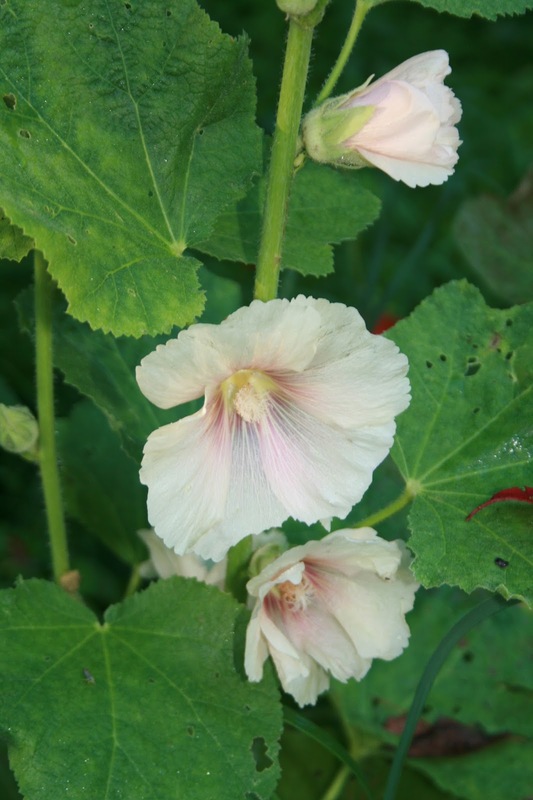 This is the old fashioned single hollyhock, my favorite, in light pink. Here it is in a light cream with a pink center. This is a form of yarrow called 'White Pearl'. I like to use this flower as fillers for arrangements. For whatever reason, the deer have left these pretty petunias and asylum alone (for now), so I thought I'd better take a picture before they are gone! Did you know you can plant potted Easter Lillie's outside? Every year I get a potted Easter Lily, and in the spring I plant it outside and it blooms again! Ornamental Grass. I love to watch it blowing in the wind. A ring of Hosta growing around an old maple tree. And now for the stars of the Mid-July Garden: the Daylilys! 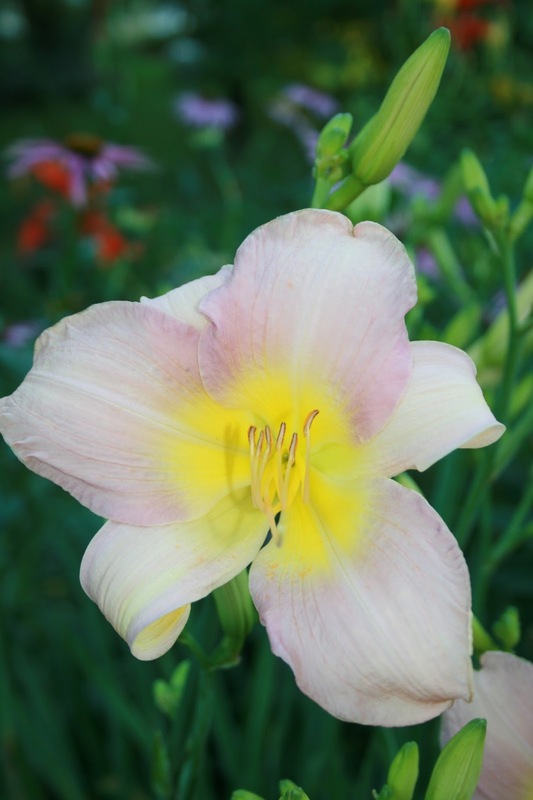 I love day lilies for they are so hardy and easy to grow, so I have many different varieties. Here is a pretty pink one with a yellow center. 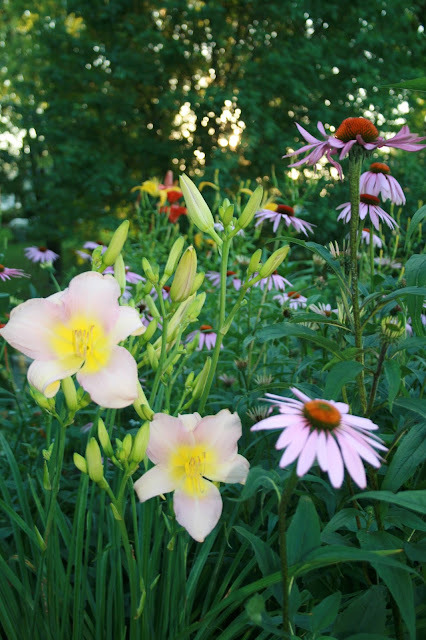 It is growing right next to the purple coneflower and it compliments that flower beautifully! 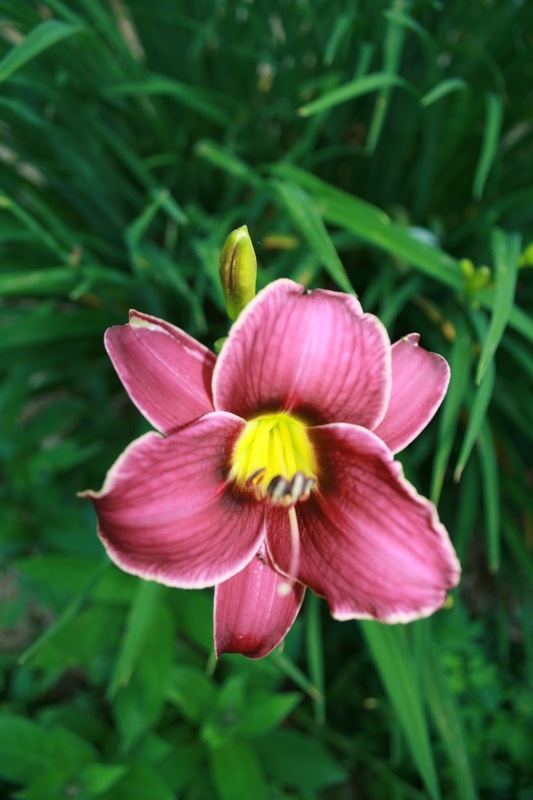 Here is a lovely wine colored daylily. A unique salmon or coral daylily. I have lots of these beautiful, bright red day lilies in my yard. They re-produce very well. 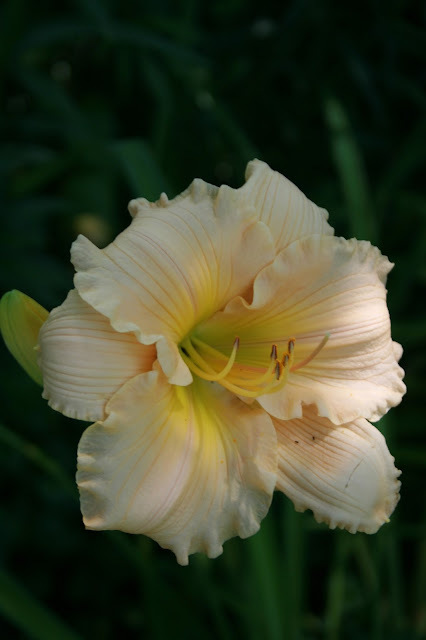 One of my personal favorites: a peach day lilies with ruffled edges. Isn't it absolutely gorgeous? And these orange pretties you see everywhere right now for they are a common wildflower. My husband dug these up out of our woods, and we planted them on our septic mound and they LOVE it! If you have a troubled spot where not much will grow, these are the babies to plant. But be warned: they are invasive for they spread by runners. They can quickly take a spot over, and they are very difficult to dig up. But where I put them, I want them to take over, so I don't care! And finally, a pretty yellow daylily. I hope you enjoyed my tour of my Mid-July garden, next week I will focus on my containers placed on my outside porches. Heavy on earth, indeed your garden truly is. I would never go inside the house. Such beautiful photos! Very inspiring for me to work on my garden! Oh beautiful shots of your fabulous garden Amy ! Amy, your garden looks beautiful. I love my day lilies too! That picture of the butterfly on your cone flower is awesome! I hope you will join us again tonight for the party:). Beautiful flowers, thank you for sharing. I need to plan for a little longer flower bloom time. I do have a few more left to come on for Aug. So many gorgeous blooms! It looks like the flowers in your area are enjoying summer! So glad you shared this outdoor post on The Maple Hill Hop this week! Hope to see you again soon!